If you enjoy word games, crossword puzzles and unscrambling words, articulation player's edition is a game made just for you. It's multiple games in one. 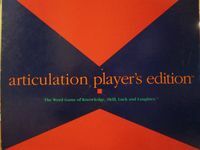 Fun, entertaining and informative, articulation player's edition challenges you to answer questions in seven card categories - word origins, jargon, slang, vocabulary, crossed words, unscrambled and roll 'em - but you better answer quickly because three of the seven categories are timed!